The Catholic Religion has had a lot of weight in the history of Spain, as can be seen by the existence of dozens of cathedrals all over the peninsula. These impressive monuments are part of Spain's national heritage due to their immense historic, religious and architectural value. This ranking displays all cathedrals classified not only by their beauty but also by their antiquity and the role they have played in history, like creating new architectural and cultural precedents. 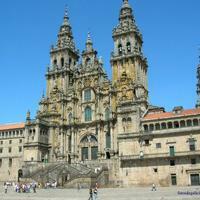 Go ahead and vote and help us find the Spanish cathedral that has most impressed the world. A mí particularmente las que me gustan son la de SANTIAGO DE COMPOSTELA, con todo lo que históricamente significa. Y luego, son preciosas por dentro y por fuera las de TOLEDO, BURGOS y esa mezcla cristiano-musulmana de CÓRDOBA.